In December, Martha Stewart Living magazine featured "grown up" paper snowflakes, which you could make using printable templates from Martha's website (click here to see them). In the magazine, paper snowflakes decorate a wall above a festive holiday buffet table. At my house, they grace a window in our family room. They were fun to make, but not necessarily easy. While Martha used a variety of fancy papers for her snowflakes, I used basic copier paper for mine, in both blue and white. The small Bears made snowflakes with me and I thought it would be best to stick with regular paper for ease of cutting. The templates could be scaled to fit your paper (some of Martha's snowflakes were huge), but I printed them as-is, and used them as more of a guide, sketching some of the shapes onto my paper. I did this for the same reason I chose regular copier paper: the designs were surprisingly complicated and the whole thing felt stressful within the first few minutes. I would say that we were inspired by Martha's snowflakes, as opposed to strictly adhering to her ideas. The paper needs to be cut into a square before you begin; I just folded my copier paper diagonally and cut off the extra bit at one end (an old trick from my amateur origami days). Next, you fold the square diagonally twice, resulting in a triangular shape, then both sides of the triangle are folded toward the center (see Martha's site for details about the folding). At this point, you'd staple a template onto your folded paper and start cutting on the lines of the design. Since I didn't scale my templates to fit, I was basically copying the designs by hand, as they fit on the paper. I really liked drawing free-hand designs on my paper. You can't really go wrong with a snowflake; any cuts will result in an interesting design. My snowflakes were far from perfect. If there's anything I've learned from my year with Martha, it's this: sometimes it's a very good idea to close your Martha magazine and focus on doing the best job you can do. It's exciting to make a snowflake, isn't it? You can never be sure what it will look like until you unfold it. This one was surprisingly pretty. Meanwhile, my elf brigade worked on their own snowflakes, made with more traditional techniques. It was one of the first days of the holiday break; they weren't feeling well and it was really cold outside. It was nice to get busy with snowflake production for an hour or so. We taped our snowflakes to the window, as seen above, and it looks mighty wintry in the family room. I'm glad the three of us could make them together. Our snowflakes are the final installment in my year with Martha. I can't believe I managed to try something new from her magazine every month for a year. I set this challenge for myself around this time last year, largely because I was feeling a bit uninspired in my cooking and crafting at the time. I love to do both, but sometimes it's hard to find the spark, you know? 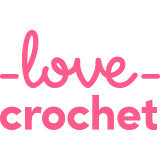 I began a subscription to Martha's magazine as a way to bring in some new ideas, and decided to try at least one new thing from each issue, and blog about it at the end of each month. Readers, you were so supportive! 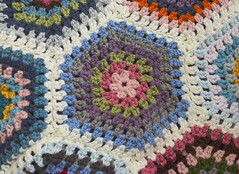 I really enjoyed this project and it was fun to read your thoughts and comments on my posts. Thank you! I hope you felt inspired to try new things too. I thought I'd share a little retrospective of my Martha & Me project, if you're interested in checking out any of the things I tried along the way. Spaghetti with collard greens and lemon; Honey blondie bars; Swedish Fish valentines; Mango upside-down cake. 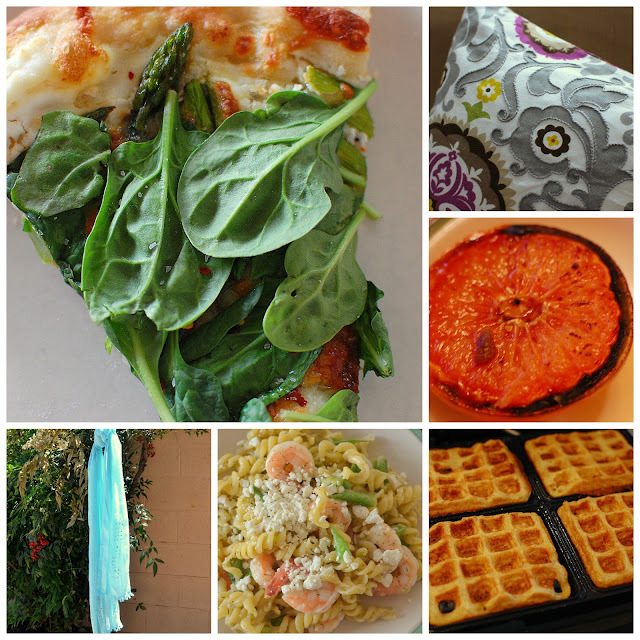 Asparagus and watercress pizza; Embroidery-embellished pillow cover; Bruleed grapefruit; Buttermilk oat waffles; Gemelli with snap peas and shrimp; Painted scarf. 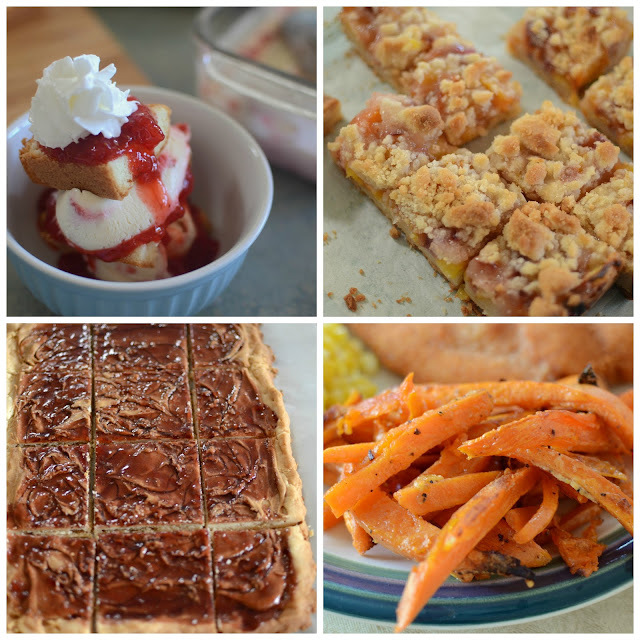 Strawberry shortcake sundaes; Peach pie crumble bars; PB&J tart; Sweet potato-parmesan fries. Dia de los Muertos cookies; Tian Provencal with polenta; Perfect paper snowflakes. Martha can be a tough act to follow, as you probably already know. I felt intimidated at times, but I'm proud of myself for giving it a try. Some of my experiments were more successful than others. Some were truly wonderful, some were downright frustrating. But they all helped me learn something new and I'm really glad I stuck with my challenge. They look very pretty! I've done this type before and find the hardest part is cutting through the layers of paper. You three did good! I remember making these as a child! They look lovely, and the copy paper works well. We made them from old newspapers :) Well done throughout the Year of Martha. What a good idea. Happy New Year Jennifer. your snowflakes are wonderful. I love making them, and we usually have a snowflake making challenge at K's birthday party! 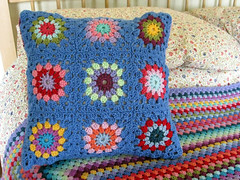 I remember making these as a child, it's a lovely activity for all ages, isn't it? Your window looks very pretty adorned with snowflakes. 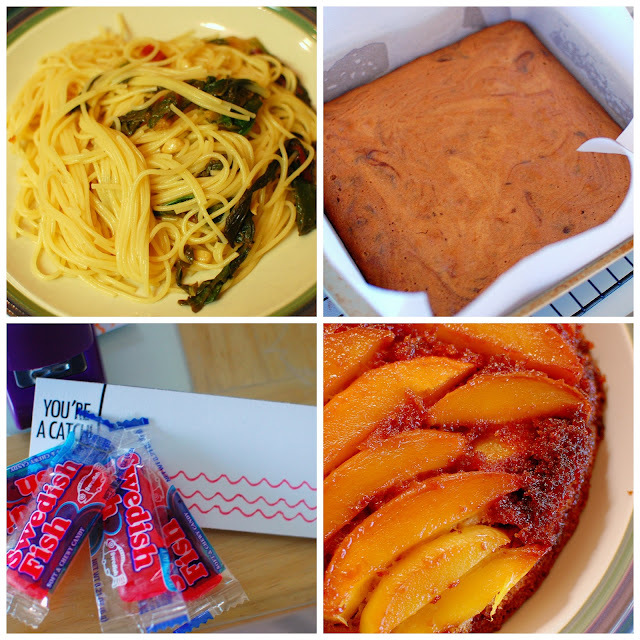 Well done for sticking to the challenge, you've tried some wonderful new crafts and recipes this year. No need to feel intimidated. You kept up with her just fine! I haven't done snowflakes for years. Maybe I'll start the new year at school by making some with my students. I made snowflakes with some of the children I work with, they are loads of fun. Yours are a delight. These are beautifully intricate snowflakes and I can see from your pencil marks how tricky they must have been to cut. My children used to make snowflakes out of white tissue paper which was easy to fold and cut. When finished we used to hang them with thread at different heights in front of a window and they would dance around like real snowflakes. Well done on completing a year of Martha makes, you've had some major triumphs as your collages prove. I think it's great that you challenged yourself with a year of new projects and menus. We all need to learn and grow such as this. Thanks for sharing them. I loved making snowflakes when our kids were small and very much enjoyed remembering while reading this post. You and your elves did a wonderful job with your snowflake window. :-) it's been fun watching you experiment through the year with Martha. You have been an inspiration. Happy New Year Jennifer. I give you a lot of credit for at least sticking to this plan every month. I probably would've given up in frustration after the first unsuccessful attempt at something. Your snowflakes are really pretty...I liked cutting those out as a kid. Great project for adults to work on with kids, too. Hope you all had a good Christmas and that everyone in your house is feeling well now. I remember making paper snowflakes with my daughters when they were young. We hung ours in the living room windows as well.